Lush Fab Glam Inspired Lifestyle For The Modern Woman: Something Blue, Something Sparkly Wedding Nail Inspiration. Something Blue, Something Sparkly Wedding Nail Inspiration. 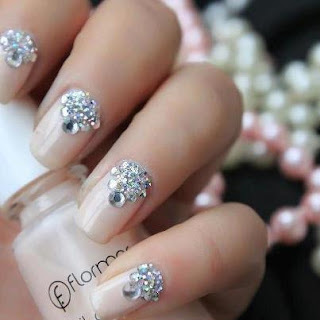 We love these elegant nail art designs which are perfect for the bride or bridal party. From glam crystal embellishments to a shiny pastel blue and a mirror-effect french manicure. Read on to see more wedding/bridal nail art inspiration photos. Crystal embellished neutral manicure.To get this look try Nicole by O.P.I Sheer Fun nail polish. Pastel blue nails with a shiny top coat. 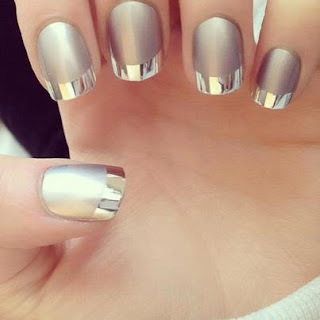 Get this look: To get the stainless steel/mirror effect manicure, use metallic nail art foil. Click here for details on where to find them. Do you know a blushing bride-to-be? Share this wedding nail art inspiration post with her using the links below. Ps. please follow me on bloglovin, I'll follow back! You can use either metallic press on nails or metallic nail art foil which is what's used above to get the stainless steel/mirror effect manicure. I love them too! How awesome they look!